An electric garage heater comes in many forms ranging from a small space heater to a power-hungry 240 Volt blast furnace. If you only need to warm a small area of your garage you are working in, then a small garage space heater may fit the bill. However, many people will desire the warmth and comfort only a large heater can provide. While electric heaters are generally less efficient than gas heaters for warming an entire garage, electric does have an advantage. With an electric heater, there is no hazard of carbon monoxide fumes that require ventilation with most gas ones. There are three main types of small electric space heaters. The first type is commonly referred to as a forced air heater. These heaters have resistive heating elements that get very hot while a fan blows air across the elements. This type of heating warms the air in a given area only as long as it is running. Similar to the design of your electric hair dryer. Convection heaters also heat the air in the room. However, an electric heating element is used to warm a transfer liquid (such as oil) which then gradually releases the stored heat into the room. Convection heaters release a more consistent heat and use less energy than forced air heaters. Convection heaters can be of a portable variety or mounted baseboard and wall heaters. Though baseboard and wall heaters are stationary units, they are nonetheless considered space heaters as well. Infrared or radiant heat is the third type of electric garage space heaters. Radiant heaters work by physically warming objects such as your body, the car, floors, and walls. Just like the warmth of the suns’ rays, you must be in the field of view of the heater to be warmed by a radiant heaters source. Since these heaters operate by warming objects, radiant heat is retained long after the heater is turned off. A Radiant heater can help you save energy by heating only you work area, as opposed to your entire garage. 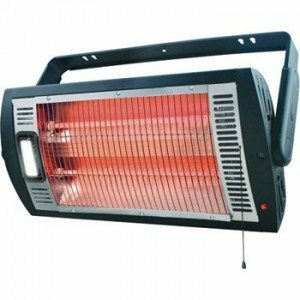 Here’s a great wall or ceiling mountable inexpensive Radiant Heater for over your work bench.